The mysterious cult of the Outward Path has been hiding something for too many years under a cloak of magic. Now comes the time to form your team and start the battle in the effort to invade their fortress. Make sure you pick the right members, some are warriors, archers, clerics and sorcerers. Make your picks and then enter the dungeons. When you spot an enemy you will get to fight them in a turn based combat system. This is a strategy game so you will be doing all the thinking. Make sure you are prepared for combat and win to gain experience and become more powerful. 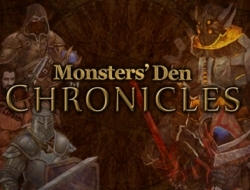 Monsters Den Chronicles 10.00 between 0 and 10 based on 1 votes.